A look at some of the top trends from Toy Fair 2015 — the best-behaved children’s party ever. With 13,000 international buyers and the equivalent of seven football fields full of exhibitor booths, Toy Fair 2015, held in New York in February, looks and sounds like the best-behaved children’s party ever. Without the young ones in attendance, of course. Because this party is serious business. Buyers come to see new products and place orders for stores, family restaurants and schools around the globe. Here’s a look at some of the top trends at the show this year. Bluetooth technology has been a boon to toy makers. Slap on the Moff Band ($55 at amazon.com), a wearable smart toy that’s synced to an app, and shoot your arm around to make sounds like animals, vehicles or musical instruments. Tiggly showed several tablet apps for preschoolers, including Tiggly Shapes and Tiggly Counts ($30 each at tiggly.com), which can be tapped on the screen in interactive learning games. Lego’s Fusion ($35 at Toys R Us) won the award for e-connected toy of the year from the Toy Industry Association. You begin by constructing a town, then scan your building facades onto a device, and interact with your avatar and the virtual townsfolk as they finish your projects. 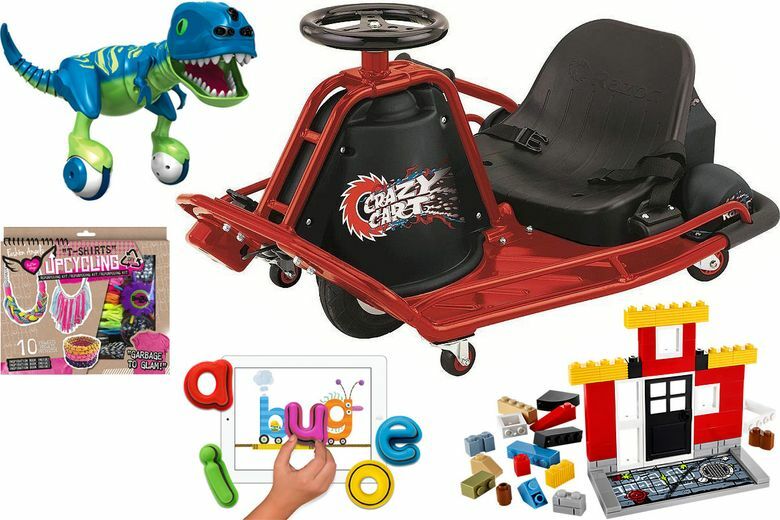 Spin Master’s Zoomer Dino ($70 at amazon.com) won the overall toy of the year award at the fair. You can train the remote-controlled dinosaur to follow you, dance, chase and roar. He rolls along on two ball-like legs using proprietary balance technology. Sphero’s Ollie ($100 at store.gosphero.com) is a little rolling toy equipped with rubber tires and hubcaps. Controlled via iPad, Ollie can race outdoors on sidewalks, ramps or more rugged terrain, or whiz and whirl indoors. Ann Williams offered the Loopdeloom Weaving Loom Kit ($30), full of felt loops that just need to be woven together to create scarves or throws. The Craft-tastic Pom Pom Kit ($25) can make up to 24 pompoms at once. And with the Craft-tastic String Art Kit ($20, all at annwilliamsgroup.com), kids can create 3-D sculptures with colored string. Fashion Angels has “Garbage to Glam” craft kits (launching soon at fashionangels.com), which upcycle plastic bags, bottles, T-shirts and old stuffed toys into picture frames, jewelry or purses. Alex Toys offered a collection for the young naturalist called Backyard Safari which includes a Base Camp Field Shelter ($44), Cargo Vest ($17), 6-in-1 Field Tool ($12, all at amazon.com), habitat containers and much more. Got a bag of mini marshmallows? 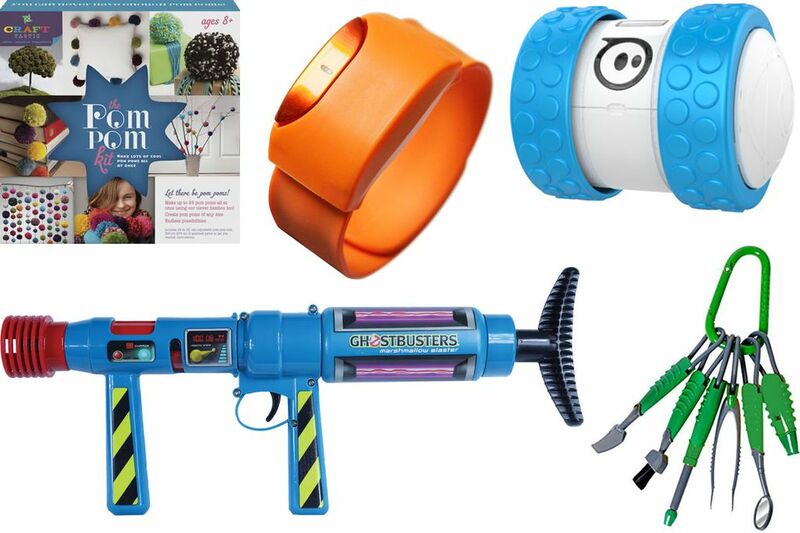 Load up your edible ammo into a blaster, shooter or launcher from the Marshmallow Fun Company and begin the battle; there’s a Ghostbusters Blaster ($28), Mini Bow ($19) and Snap Dragon slingshot ($11, all at marshmallowville.com). Razor showed some new iterations of its iconic scooter. Ali Kermani, a product designer at the company, was whizzing around the booth on Razor’s Crazy Cart ($299 at amazon.com), an electric scooter with wheel and lever controls.